We created an exciting publishing project that reminds us not just why we love what we do, but celebrates everything we learned in the past few years. One of our favorite creative agencies, The Church of London (TCOLondon) has a passion for print. Their in-house team of writers and designers publishes two independent magazines. Little White Lies (LWLies), a magazine about truth and movies that consistently features stunning photography, editorial illustrations, and interviews on cinema. Huck, is a lifestyle magazine with its heart in the surf, skate, and snowboarding culture. 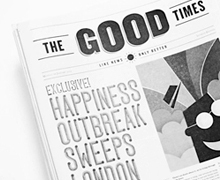 In addition to crafting their bi-monthly publications, the team recently took on the feat of sourcing content, designing, and printing a one-off newspaper called The Good Times, all in seven days. TCOLondon wanted to start 2012 with a shot of optimism and “created an exciting publishing project that reminds us not just why we love what we do, but also celebrates everything we learned in the past few years.” They started with their own ideas for content and used their social media network to find additional contributors and editorial content including articles, writing, and photography. They printed 10,000 copies and coordinated the print date with what is supposedly the most depressing day of the year, January 16th. Talk about spreading cheer. They documented the entire process on their blog, including the process of gathering and editing content. We loved watching their editorial article list change throughout the week from yellow: ready to sub, to green: ready for design, to blue: on the page, ready to proof, and finally to red: done, good to go. More to come from Danny on Little White Lies, the changing self-publishing industry, and the importance of a publication’s message.